The engineering of lightweight vehicles requires manufacturers to combine functional metal components with lightweight, highly durable carbon fiber reinforced plastics. Fraunhofer researchers have developed a variety of solutions for joining such disparate materials – and will be showcasing their technology at this year's Hannover Messe on April 1-5, 2019 using an e-scooter demonstrator (Hall 17, Booth C24). Whether it is buses, cars, scooters or bicycles, it seems certain that electromobility will power the future. One of the biggest hurdles at the moment, however, is how to increase vehicle range – a challenge that will depend on making vehicles as light as possible. The lighter the vehicle or transporter, the longer the energy storage lasts. In this domain, Carbon Fiber Reinforced Plastics, or CFRP for short, are the material of choice – as strong as steel and yet some eight times lighter, and even three times lighter even than aluminum. The general practice is to manufacture individual components, the vehicle frame for instance, using CFRP, and then join them to the function-bearing metal components using screws or adhesives. In other words, components that connect long expanses and transfer loads can be manufactured using CFRP, while metal is reserved for the functional components and attachment points for the steering mechanism, for example. Now, researchers from the Fraunhofer Research Institution for Casting, Composite and Processing Technology IGCV at the Technology Center in Augsburg have come up with a variety of innovative new techniques to join conventionally cast components with those made of CFRP. 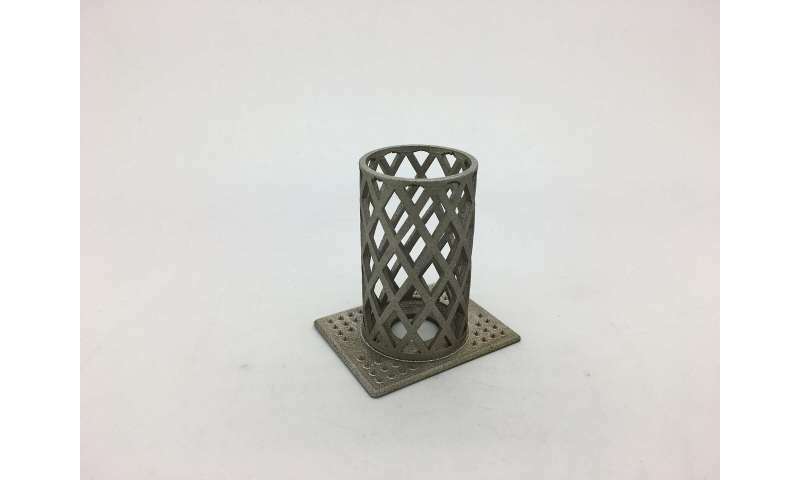 Looking beyond the thoroughly established foundry technology, there is a lot of potential in modern manufacturing techniques such as additive manufacturing and 3-D printing. 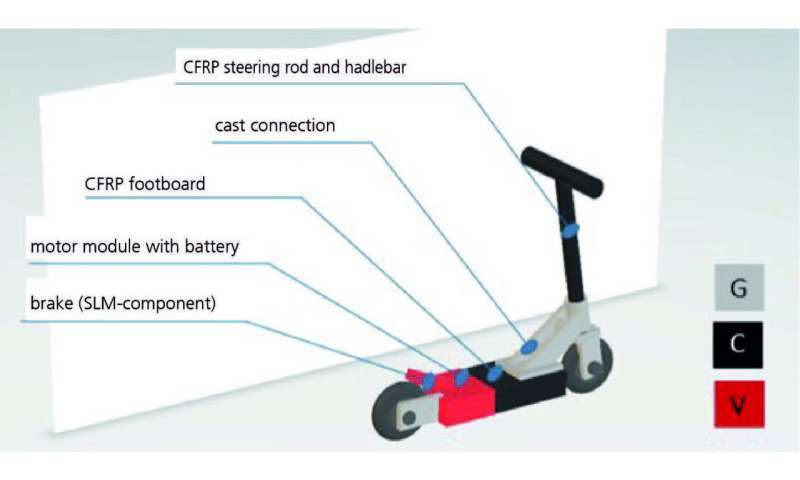 "We've combined the various new joining techniques in an electric scooter demonstrator. The goal is to cut down on the number of mechanical attachment points and simplify the joining process as much as possible," explains Dr.-Ing. Daniel Günther, who heads the project at Fraunhofer IGCV. "There's a lot of potential in combining metal and CFRP components, with a potential weight saving of up to 50 percent depending on the part." The steering head of the scooter is a hybrid component, with an aluminum base frame linking to the footboard behind and the handlebars at the front.This part of the scooter is full of parts integral to its functioning, with a significant expanse to bridge in-between. Using CFRP parts ensures the necessary rigidity. The two different materials are joined together using adhesive bonding. "In terms of a baseline load, we assumed a person weighing one hundred kilograms performing jumps with the scooter. To support that sort of load using a pure aluminum cast part, you would need a huge amount of material to ensure sufficient rigidity," says Günther. To manufacture the part, Günther and his team began by analyzing the available installation space. As a rule of thumb, the more room used, the larger the cross-section of the component – and the better its rigidity. The material has to be kept as thin as possible, however, to ensure that the component does not become overly heavy. The solution to this is to use CFRP in combination with cast metal. As a further step, the researchers calculated the load at various points of the component. The splices have been precisely positioned at the points with the least load. Rigidity is guaranteed thanks to the shaping of the CFRP component. The load-bearing capacity and durability of CFRP comes from the fibers contained within it. Here, the main challenge lies in transferring the force acting on a component so it is absorbed by these same fibers. On top of this, engineers need to ensure that any metal parts are as securely attached to the CFRP components as possible, without any gaps or cavities. In response, the researchers have developed a completely new joining technique – best explained by taking a look at the components involved. 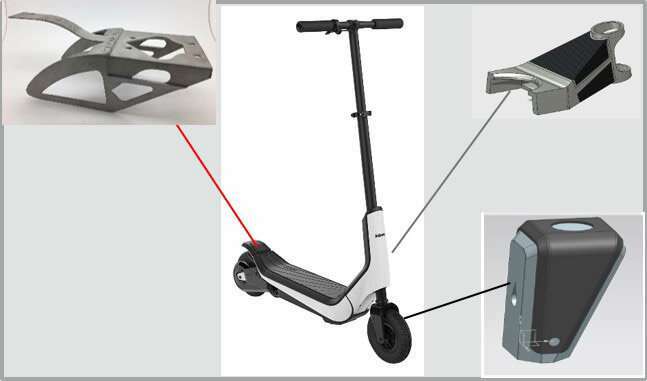 In the example of the electronic scooter, you have a cylindrical piece connecting to the handlebars, a steel component made using an additive manufacturing technique. The bottom of the component has a plate that works as a base with small pins sticking out from its surface. Researchers then overlay this base plate with the prepregs for the CFRP component, made out of fibers coated with synthetic resin. Afterwards, they apply vacuum and increase the temperature. The resin encloses the carbon fibers, flows downwards and closes the gap with the metal plate, hardening to form an adhesive bond. Here, not only does the resin stick to the plate, the protruding pins are also enveloped and held in place by the fibers. This interlocks the components and supplies a solid bond – without the need for screws or additional adhesives. "The technique is fast, industry-ready and can easily be scaled up for mass production," says Günther.